Discussion in 'How is your display put together...' started by denno020, Nov 18, 2018. I just finished putting up these light mounts that I created this year. Previously I've always tried to do something that wasn't permanent (like using binder/bulldog clips to attach to the edges of the ridge capping), but this year I decided that I'm just going do to something permanent. Basically, I started with a Carinya "Make a Bracket" bracket (this one). Then I've taken a hammer to it, to bend it slightly for maximum contact with the curved nature of the ridge capping. Once they were all bent, I then spray painted them the same colour as the Colorbond Sheets (not the bottom), so they're at least somewhat camouflaged in the off-season, and hopefully have some protection against rust. I then got up on the roof and cleaned each ridge with some pine-o-clean, so I could attach the brackets to the ridges using Gorilla Double Sided tape. I never intended on using double sided tape, however when I walked past it at Bunnings (it's in the same aisle as silicone), I noticed that it said indoor and outdoor and that it's weather proof, so figured it would be worth a go. I also bought some Roof and Gutter silicone in the same colour as the roof, and injected that into the diamond holes and along the edges (first time using a silicone gun, the stuff just keeps coming out! Please don't judge too harshly). So after all that, the above images are what I ended up with, and I'm very happy with it. We'll see how long the double sided tape will last. I have read around here that double sided tape won't last, but because this says it's weatherproof, I want to give it a go. The silicone is there as backup. The advantage of using the double sided tape and the silicone, is that I didn't have to wait for the silicone to dry before I started attaching cable ties to the brackets. Speaking of cable ties, I made sure to get ones that said they had some "carbon additives for added UV protection", whatever that means. The best part about these brackets is that I now get to have the LED string sit right on the top of the ridges, which satisfies my OCD very much. Hopefully they'll last more than just this season! bigdeer and AAH like this. I have also used double sided tape, but only as a temp fix while the silicone dries, no matter what they say it will eventually fail, it also won't have the strength of silicone or similar, so with a bit of wind etc, it may come away. So long as you used a good quality silicone, that should hold fine. For future reference, I would use a small amount of tape, then apply silicone and sandwich it between the roof and bracket. I also use the paint a bracket the same colour as the ... trick, I have brackets on the underneath of my fence that are there permanently, It is so much easier to install lights each year and remove them. bigdeer and denno020 like this. Looks good, hopefully the silicone lasts, I use 20mm elec conduit on my roof outline with pixel strip, for a permanent set up, I bent some 20mm steel strip in L shape, drilled two holes, one for roof screw and one for a 5mm bolt to mount a conduit clip, once painted and mounted it is a simple matter on pushing the conduit into place. One advantage is that you can vary the length on the vertical to get the strip over the roll on some barge cappings or other obstructions. 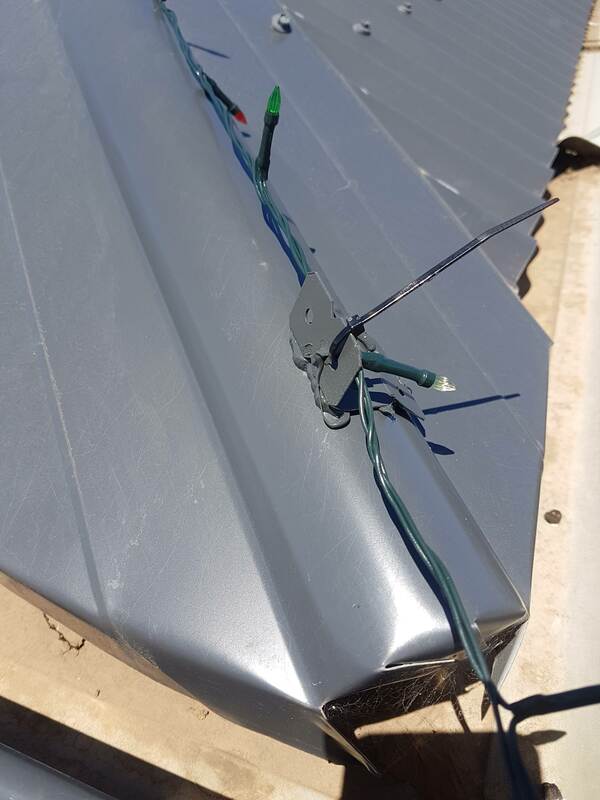 The only problem is that this new colorbond roofing is a lot more slippery than the old gal roofing. Once up I leave the mounts there all year and being steel have no problem with galvanic action. If you want to use a permanent double sided tape then use the VHB from 3M. I don't know who suggested it, but someone on here at some point suggested using magnets, I bought a stack off Ebay and I'm just heatshrinking them onto the strip every 30cms or so, I'll see how that goes. Might be an idea for you in the future. I actually have magnets! And I was going to use them however I wasn't sure how to attach them to the roof without the magnet having to go directly onto the tin. I figured that would be a, ahem, magnet for rust. Your heat shrinking idea sounds perfect though! 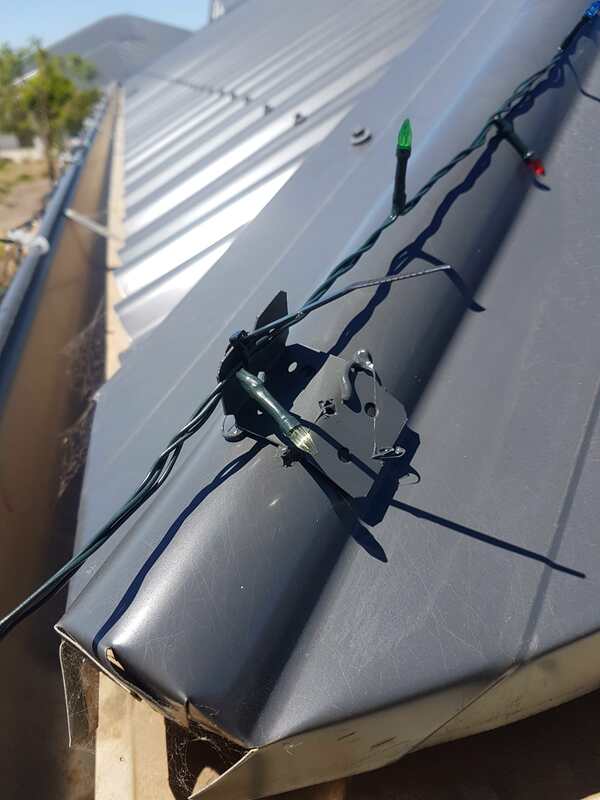 last Christmas I just backed off the roofing screws, tied a twist tie to the screw, screwed it back down, and then the other end of the twist tie, I tied to the lights. Not sure how long it will last, but I did leave the lights up, so it's survived over 3 months now. Somewhat a working option for a temporary-permanent affixing. Yep, just plugged them back in, and all still in place now...... of course will it still be there in 8 months times though !